miniSIPServer event channel is a message channel built on web socket. MSS sends inner call status to outsides applications through this interface. Event channel is over websocket, so applications must establish websocket to MSS firstly. Event messages are JSON format text. At this time, MSS will check IP address of applications for authorization. If the IP address isn't configured in MSS, MSS will reject websocket connection from such IP address. By default, MSS opens TCP port 5080 to accept websocket connection. Of course, you can change it according to your own requirement. Please click menu "Data / System / Basic" and update "event channel port" illustrated in below figure. 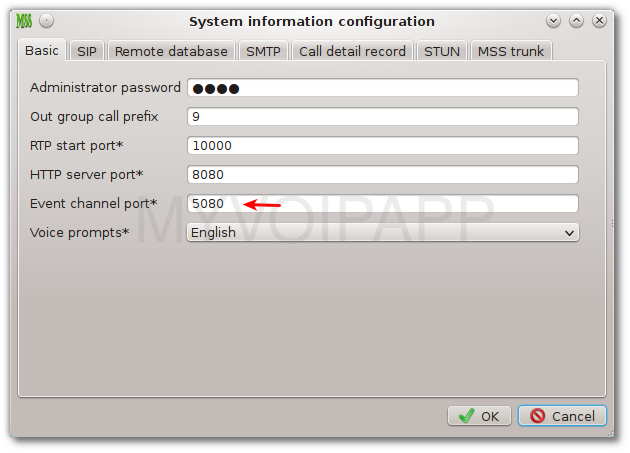 If application wants to connect to MSS event channel, we must add its address into MSS for authorization. 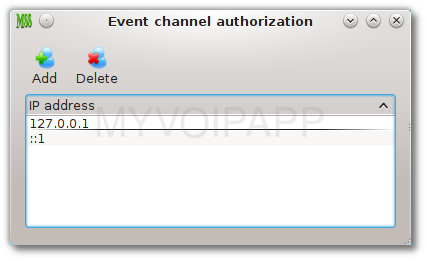 Please click menu "Maintain / Event channel authorization" to add IP addresses to be trusted. This section describes all details about event messages sent from miniSIPServer. As we said, all messages are JSON format text strings. Here is a demo event message from miniSIPServer. It is used to report status of local user '600'. Every event message MUST include 'command' paramter. This parameter indicates what this message is. At this time, it can be following values. 'userStatus' event includes following items. userName string Local user's name or number. online - the user has registered to miniSIPServer. offline - the user is offline, it has unregistered from miniSIPServer. miniSIPServer will report every SIP calls state via these event messages. Since each call party could be in different call side, these messages will have different parameters. That means following paramters are optional according to different calls. sipID string This is miniSIPServer inner ID. It is unique resource ID in miniSIPServer for each call. callID string This is retrieved from 'Call-ID' parameter of SIP messages. 'callID' is unique in a SIP dialog. Please pay attention that it could inclue several different 'sipID' in the same SIP dialog. stage string Stage of current call. It can be following values. dial - the call is just invoked now. alert - the call is ringing back tone or playing alert tone. talk - called part answers the call. idle - the call is released. type integer It indicates what kinds of call type current call is. 1 - this call is outgoing call, that means the user is making call out. 2 - this call is incoming call, that means the user is receiving call. address string The user's IP address. from string Caller party number. to string Called party number, or destination number. setupTime string The timestamp when the call is initiating. alertTime string The timestamp when the call is ringing or playing ring back tone. talkTime string The timestamp when the call is picked up. idleTime string The timestamp when the call is released. Here are some sample messages. (1) The call is invoking. (2) The call is released.